Pompeii was built on a highland at a middle height of around 30 ms. on the sea-level formed from a prehistoric lava casting. At the mouth of the Sarno river (at that time navigable), the city was destined to become the harbour of some countries far from the sea. The name may derive from the Oscan “pompe” (five), to mean a community of five villages, or from the Greek “pempo” that means “to send”, to underline the fact that it was a huge commercial harbour able to supply of agricultural products (oil and wine) different points of the Mediterranean. Soon Pompeii was influenced by two populations of superior civilization, established in Campania since the VII century B.C. : the Greeks of Cuma and the Etruscans of Capua. These last succeeded to the Greek between 530 and the 474 B.C. when they conquered the coast and they became a big power of the Mediterranean. The Greeks, defeated the Etruscans with the help of the Syracusans, held Pompeii up to 438, when some Samnite populations belonging to the same log of the ancient Oscans, invaded the whole Campania. It goes up again to this period the expansion of the city from 9,3 to 63,5 hectares of territory, extending itself till the whole lava casting. In the IV century B.C. the Samnite populations that lived on the Apennines did new invasions to damage the same Samnites of the lowland and of the coast, by now totally urbanized. For the occasion (300 B.C.) they were forced to restructure the urban boundaries made by Sarno limestone. Even Rome, in help of the Samnites of Capua, took part to these events (Samnite wars: 343 - 290 B.C. ), going out of it victorious and becoming the mistress of the whole territory. 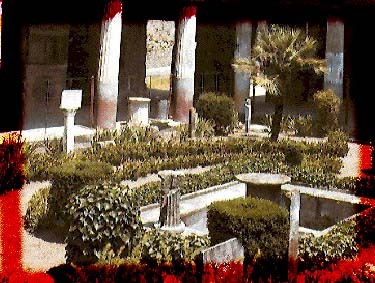 Pompeii drew from this situation a notable positive push in the commerce and in the art. It goes up again in fact to this period the frequently employment of Nuceria tufa, above all for the public buildings that were partly restructured, partly built ex - novo.